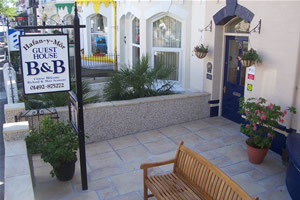 The Hafan-y-Mor Guesthouse is situated mid terrace on a level street in the centre of Llandudno. It does not have any private parking although there is no limitation to on street parking. The front gate is 29 inches wide opening on to a wide path and gentle slope leading to the front porch door. Proceeding though 2 doors into the hall, immediate right is the dining room, door width 30 inches. Next right is room 1 our only ground floor room. This room has a double bed with en suite facilities. All other bedrooms are on the 1st and 2nd floors. The 1st floor is up 17 stairs for rooms 2 and 3.Room 5 is up a further 11 steps and rooms 6 and 7 are on the top floor a further 7 stairs.